At Linmoore Fencing, one of the most common orders that we get from our customers is for wrought iron sliding gates. There are several reasons why sliding gates are such favorites in the Sacramento, CA area. First, they provide all the elegance and beauty of any driveway gate, but need a lot less room to operate than a traditional swing driveway gate. If you have a relatively short driveway, a sliding gate is definitely the way to go for convenience and ease of access mixed with security and safety for your Sacramento home. Instead of having to worry about leaving enough space for your driveway gate to swing clear without damaging your vehicle, you can pull right up to the gate, let it open, drive through, and stop immediately within the gate for it to close with no danger whatsoever to your car. This makes wrought iron sliding gates ideal for many Sacramento homes, especially if you have a more suburban or urban lifestyle with a limited amount of land or property around your home. 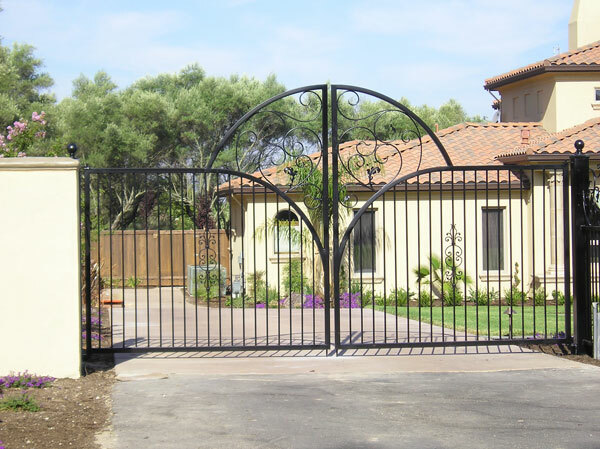 Wrought iron sliding gates are also ideal for properties such as apartment complexes and gated communities, where wasted space is potentially wasted money, and where property owners need to minimize the damage that can possibly be done to their residents’ property through user error on the residents’ part. Sliding gates are convenient and easy to use, and can easily be equipped with safety measures such as motion detectors and weight/resistance detectors to avoid accidentally closing on and injuring pedestrians, children, or pets. Wrought iron is an ideal material for any sort of entry gate, as it lends itself well to beautiful and ornate decorative patterns. You can have a custom wrought iron gate done with any sort of design imaginable, or get your inspiration from our photo gallery of beautiful projects we have done for other happy customers. Since visitors will see your wrought iron gate up close and personal, it is important that it be both beautiful and high quality. With a wrought iron sliding gate from Linmoore Fencing, you can be assured of both things, at a budget-friendly price that will make your wallet smile as well.